A year and a half ago I was ashamed of myself for how much I had let my health decline. I was doing all the things you aren’t supposed to do, and I was not doing anything that I was supposed to do. While I was unhappy with how I looked, the real kick in the pants for me was that I had trouble playing with my young kids. As a result, I have been able to lose a lot of weight and gain a lot of strength, confidence, serenity, and fun time with my kids. The road to success was a mix of calorie counting, an exercise bike at my local community center, and yoga via YouTube. My favorite channel for yoga videos is Yoga with Adriene. The channel’s host, Adrien Mishler, has a reading list for newcomers to yoga. Iyengar’s The Tree of Yoga is one of the first books listed. I’ve found it to be both accessible and thought-provoking. I can see why it was on the list, as it provides a gateway to philosophies and practices that I as a westerner was only vaguely familiar with. 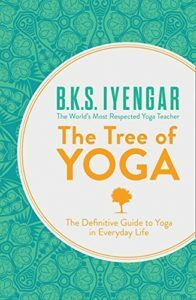 In this book (which is really a collection of lectures given over a longer period of time), Iyengar explains what yoga is by using an extended metaphor of a tree. Since so many of the concepts are new, the publisher has include two very helpful glossaries within the small paperback to help you learn the terminology. The book also includes sections on yoga & health and yoga & the self. The section on health made me a little skeptical. Yoga curing deafness seemed much for me, although it’s certainly helped my overall health, flexibility, strength, and heart, so who am I to judge? Even though this book is relatively short, I think I will revisit at least sections of it often, to help me stay aware of why I’m practicing yoga. I’m looking forward to growing in my practice and understanding of the wisdom of yoga. NOTE: I accidentally bought a used UK copy with British spellings and an incense smell, and I loved both of those things.